Allergies may interfere with your respiratory tract. Obviously, you need to stay away from known allergens or you might need to take preventative medicines. 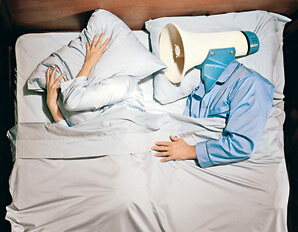 Overweight is one of the contributing factors of snoring. Losing some weight may help reduce the fatty tissue in your airway and the pushing of your abdomen on your lungs. Avoid taking certain medicines such as antihistamines and sedatives before going to bed as they can encourage you to snore. Consider avoiding dairy products before bedtime. They can increase mucus build-up in your throat, which may lead to snoring. Smoking can cause snoring. It irritates the tissues in the throat and creates congestion in some tissues of the respiratory system. Among other reasons like oral and lung cancer, quit smoking if you want to stop snoring. Elevate your head when sleeping. This can be accomplished by raising the headboard end of the bed, sleep on a firm mattress and utilize additional pillows to support your neck and prevent obstructions to your airway. If you have run through these little helpful tips and you are still snoring, you might break down and ask our dentist for help. If we can be of assistance please feel free to contact us for a complimentary consultation. We are conveniently located at Roswell Road and I-285.